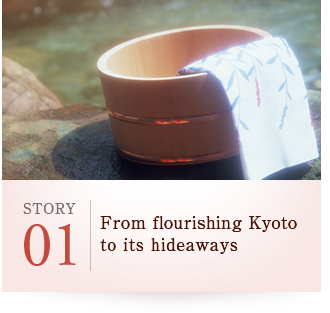 eaving the florists of central Kyoto to its "hidden ONSEN." There, you find reserved refinement that is described as "hannari" in the Kyoto dialect. 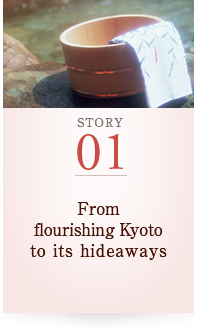 Also offering brightness and sophistication, it is "the other face of Kyoto." Why not visit "Kyoto's ONSEN hideaways" that offer atmospheres totally different from the heart of Kyoto - from the "hindmost onsen" waters of Kurama and Ohara, the "rustic onsen" of Kitashirakawa that leads to Mount Hiei and the "play onsen" with a wide range of of onsen facilities. Surrounded in three directions by the mountains of Kitayama, Higashiyama and Nishiyama, Kyoto is a prime location for enjoying the beauty of the nature of Japan and its seasons. 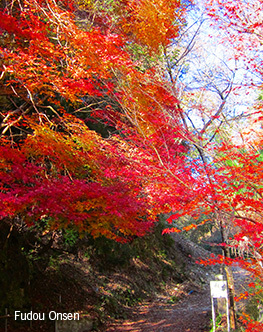 The aristocrats of the ancient times, visited "the other face of Kyoto," these areas known as Rakuhoku, Rakuto and Rakusei, to appreciate the colors of autumn and enjoy the cool air in summer, as well as to retreat from the bustle and noise of society. 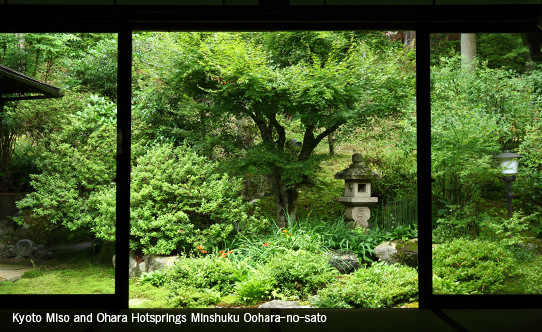 ONSEN(= hot springs) that flow in abundance in this area provide peace and relaxation to their visitors. Kurama and Ohara in the Rakuhoku area has abundant greenery and clear streams and is Kyoto's best-kept secret that can be reached in less than an hour from Kyoto City. 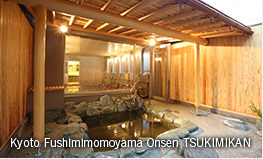 The benefits of their ONSEN is combined with the purifying air of the forests. Forest immersion is believed to bring relaxation of the mind, triggered by the aromatic agent phytoncide released by trees and also by "negative ionization" that occurs in forests. Additionally, the sound of the breeze, birdcalls and other sounds representing the rhythm of nature, called "1/f fluctuations" are believed bring comfort and relief to the mind. 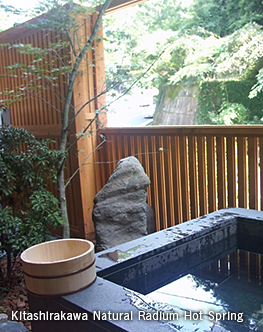 Listen to the sounds of nature and take a deep breath of the forest air while relaxing on onsen water. It is certain to wash away the stress and fatigue from everyday living. The name Kurama is said to originate from the Japanese word "kurabu (dark area)," due to the land's darkness even during the day due to dense forestation. In contrast to the cultural flair and Japanese chic of Kyoto, Kurama has been known since the ancient times as a center of mystical power that provides protection of the northern area, because of its dark and mysterious atmosphere. The open-air baths overlookijng the panorama of the mountains offer visitors the beauty of the changes in season. Ohara is called "Kyoto's mountain village" where Takanogawa stream flows by. It preserves the "view of old Japan" with its traditiional homes and farmlands, as well as its numerous shrines and temples, including the Sanzenin Temple known for its moss garden and fall foliage and Jakkoin Temple known for its ties to the Tale of Heike. 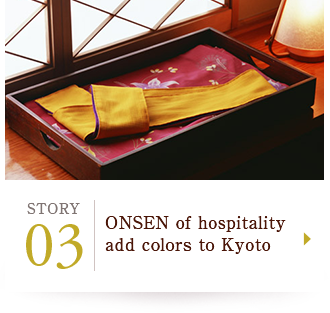 ONSEN there offer the seasonal colors, the cultured elegance of Kyoto and the atmosphere of the people who live in the area. 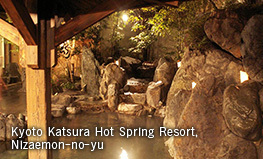 The "most secluded hideaway of Kyoto" that draw onsen lovers are recommended for those who love to immerse in nostalgia. The charm of Kitashirakawa ONSEN is found in its quiet surroundings, located along the mountain path that leads from Kyoto to Mount Hiei. Radium hormesis effect from minute radioactivity and radon gas from radiuim-rich onsen raise the body temperature and is believed to enhance autoimmunity and treat all illnesses. 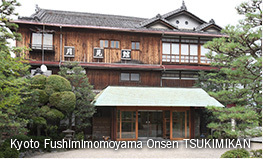 It is the favorite watering hole for onsen lovers, because of its ambience of old-fashioned long-term onsen stay. Along the quiet Ujigawa stream stands Momoyama Onsen Tsukimikan, noted for its very rare, three-storied wooden structure. 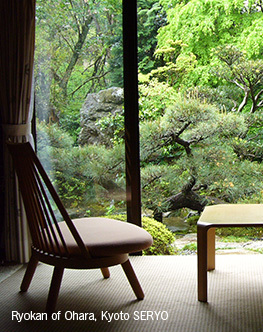 The traditional style atmophere of the ryokan and the Kyo cuisine prepared with its soft-water springs and foods in season are highly popular for offering the full range of Kyoto hospitality. What about an onsen facility with various fun features if you want thorough amusement? Kyoto culture is distinguished for its "flexibility" toward innovation, while placing importance on its cultural heritages. 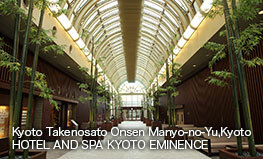 Enjoy onsen offering variety of enjoyable features at each of these facilities. 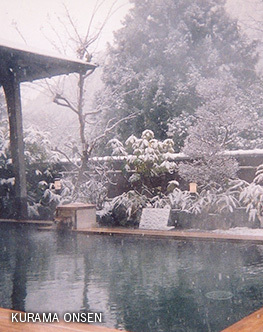 Why not travel to the "onsen hideaways" of Kyoto if you have a little more time than just sightseeing central Kyoto? 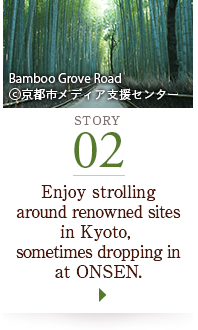 A little travel away from the city takes you to "Kyoto for the connoisseur" that offers memorable experiences. 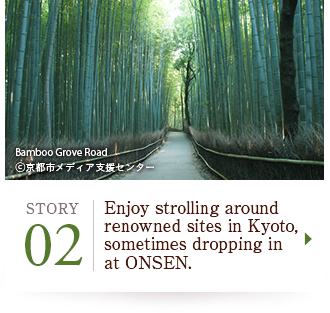 Enjoy strolling around renowned sites in Kyoto, sometimes dropping in at ONSEN.